There are multiple ways to split MP3 files on Windows. In fact, there is dedicated software like mp3splt for that exact purpose. However, do you know that you can easily split MP3 files with FFmpeg? In fact, you can do it with just a single line of command. In case you don't know, FFmpeg is a small yet really useful free and open-source tool for converting almost any media format to any other media format. 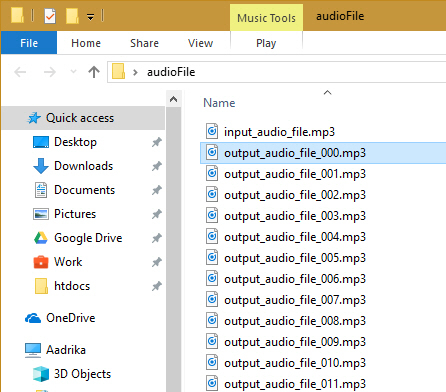 So, without further ado, here's how to split MP3 files with FFmpeg in Windows 10. Note: The same procedure is applicable to Windows 7 and 8. There are multiple ways to split MP3 files with FFmpeg. Here I'm going to show a simple way to split MP3 files into multiple chunks based on the number of seconds. 1. To start off, download and install FFmpeg on Windows. 2. 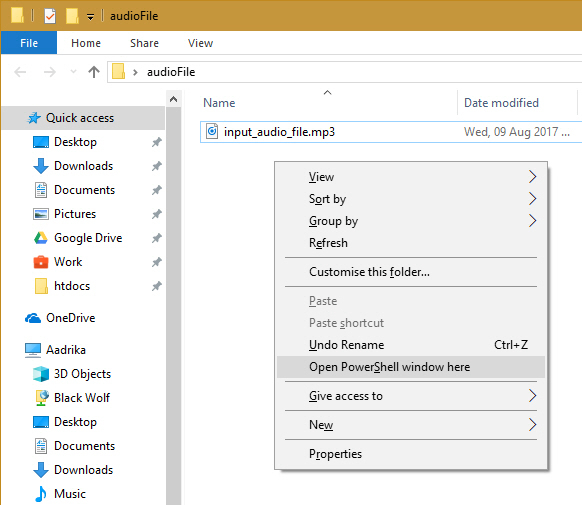 Now, navigate to the folder where you've stored the MP3 file, shift + right-click on the empty space and select "Open PowerShell window here" option. Alternatively, you can also the cd command within the Command Prompt or PowerShell to navigate to the folder. 3. Now execute the below command. By default, the below command splits the MP3 file into one-hour chunks using segment muxer. Don't forget to replace input_audio_file.mp3 with the actual MP3 file name. You can also change the output file name by replacing output_audio_file_. To increase or decrease the time, simply replace 3600 with time in seconds. For instance, if you want one-minute chunks then you should replace 3600 with 60. If you look closely, you will see %03d attached to the output file name in the above command. This bit of text is there is to add automatic numbering (like 000, 001, 002, and so on) to all the chunks. This ensures that all the chunks are in proper order. If need be you can change it to %02d so that there are only two decimal places, like 00, 01, 02, and so on. The good thing about the above command is that you can also use it split M4A format audio files too. 5. Depending on the MP3 file size, it can take a few minutes to split MP3 with FFmpeg. Once completed, you can see all the files in the same directory as the original MP3 file. That's all there is to do and it is that simple to split MP3 audio files with FFmpeg. Do comment below sharing your thoughts and experiences about using the above method to split audio files with MP3. This help me to create a script that cut an mp3 into 5min chunks by right-clicking it. Thanks a lot!